Welcome back! Today was another fun day at the conference and we finally found some time to tour the product showcase. The product showcase actually features all sorts of products and not just those that are developed or marketed by Intel. Many manufacturers have a booth and basically demo their new or latest products. One of the new concepts that was demonstrated during last IDF, the blade form factor for servers, now found its way into many products that we came across during the showcase. And although the blade form factor started out as a high-density and low-power platform we also came across dual Xeon solutions such as the one pictured below, so the blade form factor certainly is able to hold it’s own in comparison to traditional rack servers. Fig 1. An IBM blade form factor module, featuring two Xeon processors, DDR memory and local storage. Naturally Intel was keen on demonstrating all the new technology talked about during the keynotes such as the new motherboard form factors for motherboards and new chipsets for the Pentium 4. There were many proof of concept PCs to be found that more or less offered innovative new features or addressed issues such as noise production and packing a lot of performance into a very small space. The Powersville motherboard for example, featuring the new Bigwater formfactor and the upcoming Intel 865 chipset was found everywhere around the showcase teamed up with an 800Mhz FSB Pentium 4. Fig 2. A proof of concept PC featuring the Bigwater formfactor, the upcoming Intel 865 chipset and an 800MHz FSB Pentium 4. Fig 3. A closer look at the Powersville motherboard which has everything integrated and only offers an AGP expansion slot. Of course we saw not one, but rather a few dozen, of Centrino notebooks, featuring an even wider variety of configurations, ranging from the very small form factor notebooks to the desktop replacements. All the Centrino notebooks however closely followed the feature set that’s integrated into the Intel 855 chipset. Upon closer inspection only the full size notebooks were running a Pentium-M processor with a clockspeed over 1.3GHz, all of the smaller notebooks used the 900MHz variety of the CPU. Fig 4. A selection of Centrino notebooks, featuring the Pentium-M processor and the Intel 855 chipset. Naturally it wasn’t all work, we also had some time to play, and there’s one occasion that was exceptionally funny and I actually caught it on film. I’m sure you’ve heard of the miniature R/C cars that are for sale at Fry’s for example. One of the Intel PR people actually took one to the press room and both me and Anna from Xbitlabs.com couldn’t resist taking it for a test drive as evident from the video below. 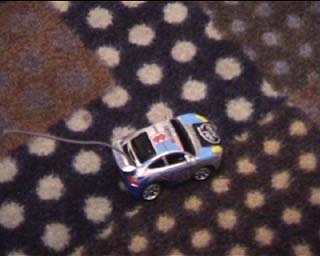 We actually challenged the Intel PR guy to a race which will take place tomorrow morning in the press room and we’ll be sure to let you know if we managed to beat him with racing these miniature R/C cars. Fig 5. A video of Anna from Xbitlabs.com driving the miniature R/C car, she told us that’s exactly how she drives in her hometown Moskou. Tomorrow the focus will mostly be on the manufacturing and Intel will undoubtedly get into greater detail about their 90nm process, strained silicon and other process techniques. Tomorrow’s keynote and the following tracks and sessions will focus on the advances made in silicon technology and manufacturing, micro architectures and circuits, but also computing hardware platforms, software, communications and networking and everything else that’ll help to enable the convergence that’s been the central theme of the whole IDF Spring 2003 conference.